FEASTING on hairy crabs over a bottle of rice wine has been long practised by the Chinese especially during the autumn when these crabs are highly sought after. The crabs, also known as mitten crabs, are hairy just like its name suggests and are usually smaller in size compared with the local crabs available all year round. Dragon-i restaurant chain chief executive officer Henry Yip Chun Hoong, who is importing five tonnes of hairy crabs this season, said the demand for the dish has definitely increased in recent years. He said customers now understood the speciality of the crab and also know how to savour them the right way. Yip made a trip to Shanghai’s Taihu Lake to meet the hairy crab farmers whom he has been receiving hairy crab supplies from for the past six years. Identity tags: Executive chef Tai Chi Kong showing a plate of live crabs with their identity tags attached to them. “There are many fake ones nowadays but only those from Taihu Lake and Lake Yangcheng in the Jiangsu province have been certified as authentic by the Chinese government,” he said, adding that the imposters breed such crabs in other lakes hoping to cash in on the big bucks with the increase in demand. 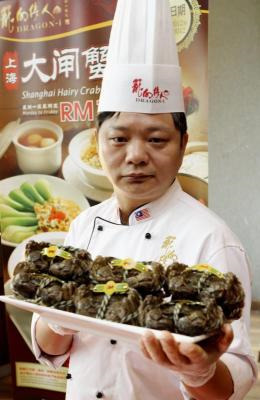 He said prices for these Shanghainese hairy crabs has escalated through the years but at Dragon-i they have decided to absorb as much as they can to allow their customers to enjoy the once-a-year treat. During the lunch review at Sunway Pyramid, Yip shared that each crab has a yellow plastic tag with an identity number to highlight its authenticity. 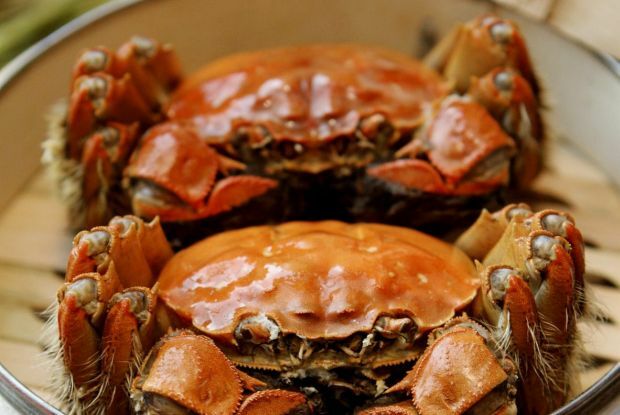 The crabs are also certified by the China Entry-Exit Inspection and Quarantine Animal Healthcare Department and the Hong Kong Food Hygiene Quality Control Department before they are shipped to Malaysia. For this year’s hairy crab promotion, each Dragon-i outlet will be receiving its supplies twice a week and the crabs are kept alive in cold waters in the restaurants. Currently diners can choose from two set menus; the value hairy crab set priced at RM138++ (weekdays) and RM168++(weekends and public holidays) which comes with Steamed Shanghainese Dumplings with Hairy Crab Roe, two Steamed Shanghainese Hairy Crabs, Chicken Soup with Fish Maw, Sauteed Fresh Vegetables with hairy Crab Roe and a serving of Fried Rice with Dried Scallops, Hairy Crab Meat and Roe. The RM198++ set serves the same dishes with an additional Braised Shanghainese Pork Belly with Lotus Leaves and Braised Shark’s Fin Soup with Hairy Crab Meat and Roe instead of the chicken soup. The Chinese also believe that hairy crabs are “cooling” food for the body, hence one should have a cup or two of rice wine or ginger tea to warm the stomach after the meal. For desserts, we were lucky to have a warm bowl of Sesame Dumpling in Ginger Soup each, as it was also part of the menu. Dragon-i executive chef Tai Chi Kong also came up with four ala-carte dishes specially prepared for the promotion which are the Braised Bean Curd with Hairy Crab Meat and Roe, Sauteed Pea Sprouts with Hairy Crab Roe and Fried Rice with Dried Scallops, Hairy Crab Meat and Roe. A special take-away deal is available for those wanting to prepare the crabs at home. The restaurant is selling four live hairy crabs at RM198+. The crabs come with a set of scissors, a packet of shredded ginger and a bottle of vinegar.